Bon Anniversaire Chez Panisse Café! 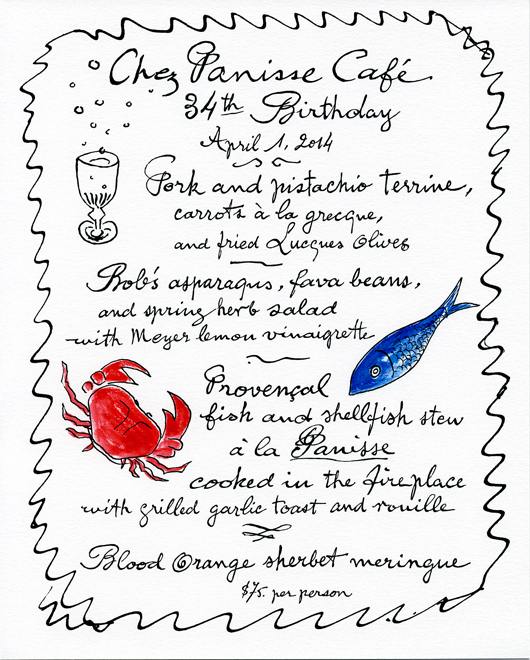 The upstairs Café at Chez Panisse Restaurant is turning 34 tomorrow. Bon Anniversaire! The occasion will be celebrated with a delicious prix fixe menu. This year, I was lucky enough to be asked to design and print the special menus. With such a wonderful French menu, I decided to draw inspiration from the sketches and illustrated notebooks of Georges Braque. Georges had the most charming handwriting and I tried my best to emulate his style while handwriting the menu, I’m very pleased with the results. Today, as the rain poured down, I hand-painted each menu with blue and red… a perfect rainy day project. I love how the small touch of color brings the whole design to life, while also creating a French blue-white-red palette. It is so enjoyable to work on such a playful and celebratory project. I hope everyone has an exquisite evening!